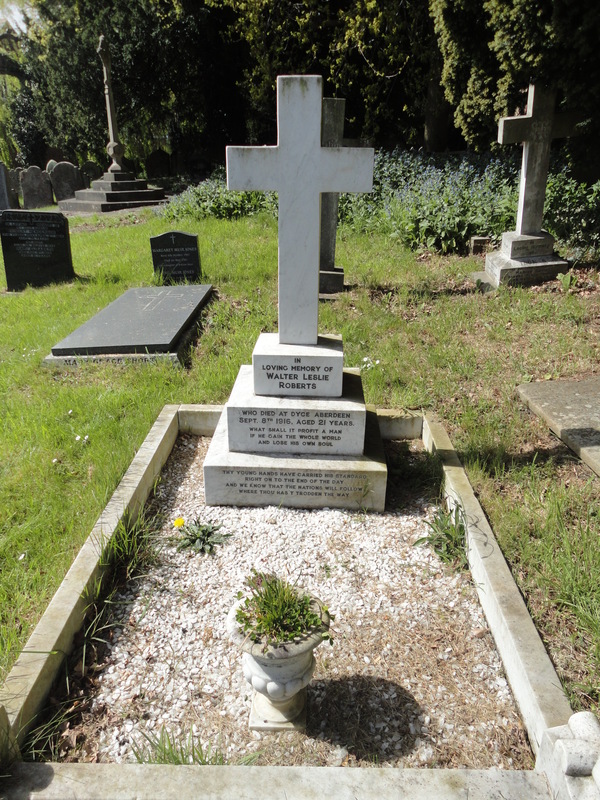 Walter Leslie Roberts was born circa 1985, the second child and eldest son of Llewellyn and Mary Jane Roberts (nee Wilde), who had married in St Mary & St Helen’s Church in Neston, Cheshire in 1893 (Cheshire West CE37/2/16). Walter Leslie’s first appearance was on the 1901 census when the family are seen living at 19, Bouverie Street, Chester (St Thomas). Head of the household was Llewellyn Roberts, 35 a Life Assurance Agent who had been born in Gwernafield, Flintshire, his wife Mary Jane, 33 had been born in Ness, Cheshire. Children, Elsie M., 7 with Walter, 5 and Alfred, 3 had all been born in Chester. By the 1911 census, the family had moved to 388, Stockport Road, Bredbury, (6 Rooms) and Llewellyn had been promoted to Assistant Superintendent for the Prudential Life Asssurance Company. Mary Jane was now age 43 and she tells us that 3 children had been born and all were still living. The couple also tell us that they had been married 18 years. Elsie Mabel, 17, was an Art Student, Walter Leslie, 15, was an Architect’s Draughtsman Junr. (Calico Printers Association) and young Alfred, 13 was a Scholar. I do not know when Walter Leslie began his fight not to enlist or join in the fighting, as he was obviously a very strong and moral person nor do I know when the family came to Hawarden, but the articles below gives a background and I am grateful to that for helping tell Walter Leslie’s story. 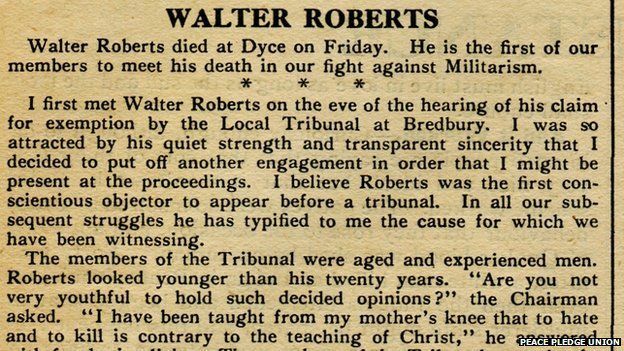 Walter Roberts from Stockport was one of first conscientious objectors to face a Tribunal. He was also the first of many to die as a result of his imprisonment. Like many others who had languished in appalling conditions in prison or been sent to France to face execution and subsequently reprieved he was sent to Dyce Camp to break rocks. Walter died two days after dictating this letter. Fenner Brockway writing in The Tribunal said Walter was ‘the first of our members to meet his death in our fight against militarism.’ Dyce camp was closed shortly after Walter’s death. Opened in late 1916, Dyce Camp near Aberdeen was made up of 250 conscientious objectors. As an alternative to prison, their punishment was to break rocks in a granite quarry and suffer the indignity of being branded as “degenerates” by the local press. The objectors were drawn from all walks of life: teachers, academics, shopkeepers and labourers. But they were in the main well educated and articulate – and even set up their own camp newspaper, The Granite Echo. Living conditions at the camp were basic and many of the men were unused to hard labour. But when one of the objectors, Walter Roberts from near Stockport, died of pneumonia, Dyce Camp came to wider attention. The other men stepped up a letter writing campaign complaining about the conditions. There were visits to the camp by a Home Office committee and by future Labour Prime Minister Ramsay McDonald. On the 19th of October, following a debate in Parliament, it was announced that Dyce camp would close. Barely two months after their arrival, the Conscientious Objectors were dispersed to prisons across Britain to complete their sentences. 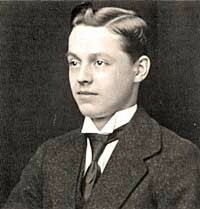 Walter Leslie was buried in St. Deniol’s Churchyard in Hawarden on the 13th September 1916 age 21 years.